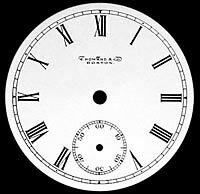 E. Howard & Co. Boston, 18 size, Dial feet @2:15 & 10:30. E. Howard & Co. Boston, 6 size, Sunk-Second, Dial feet @2:25, 7:15 & 10:40. 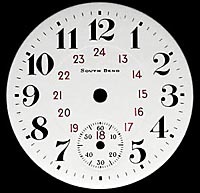 South Bend 18 size, Double Sunk-Second & Red inner 13 to 24 hr, Dial feet @10:45, 3:30 & 7:30. South Bend, 18 size, Double Sunk-Second, Dial feet @11:45, 3:30 & 7:30.